General government budget expenditure trends for individual areas (percent of GDP). Credit: Authors' calculations based on Federal Treasury data. 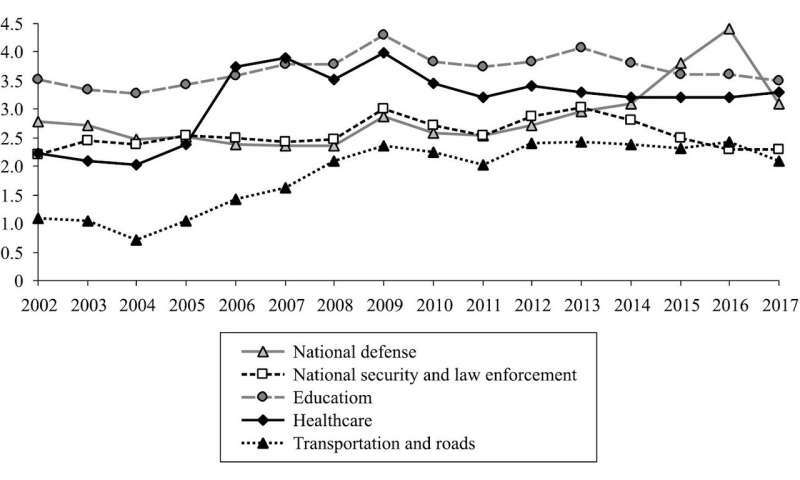 Investment in education, healthcare, sports, road infrastructure and transportation, rather than national defense and, to a lesser extent, national security and law enforcement, is what drives economic growth rates and GDP level upwards in Russia, suggests a recent analysis of government expenditure data gathered between 2002 and 2016. The empirical study, conducted by Dr. Alexey Kudrin of St. Petersburg State University, Gaidar Institute for Economic Policy and the Accounts Chamber of the Russian Federation, and Dr. Alexander Knobel, Gaidar Institute for Economic Policy and the Russian Presidential Academy of National Economy and Public Administration, was published in the open-access journal Russian Journal of Economics. In their analysis, the economists apply the Structural vector autoregression (SVAR) methodology: a modification to the traditional Vector autoregression (VAR), which allows for identification of interdependencies between data series coming from various points in time, while allowing for variables. Thus, the researchers analyzed the efficiency of Russia's government spending and how the distribution of resources impacts the national economic development, with the Gross domestic product (GDP) set as a structural variable. In particular, Drs Kudrin and Knobel looked into expenditure on national security and law enforcement, national defense, education, healthcare and sports, road infrastructure in order to estimate how resource distribution in these areas affect national economic growth and GDP. They used data from the Russian Federal State Statistics Service (Rosstat) for the period from 2002 to 2016, while also taking into account multiple international studies on the topic. As a result, they found that government spending on "power" items such as national defense, national security and law enforcement (areas also recognised as non-productive expenditure), mostly translates to extensive consumption of resources. Meanwhile, investment in physical and human capital, including education, healthcare and sports, road infrastructure and transportation (productive expenditure) is associated with both short- and long-term economic growth. The data from Rosstat confirm the researchers' conclusions by demonstrating a drop in Russia's economic growth rates in recent years, which corresponds to the shift in the general government budget spending towards "power" items. On the other hand, Drs Kudrin and Knobel present evidence that a maneuver in favor of human and physical capital is capable of increasing Russia's GDP with 25-35% in a single generation (25-30 years). "Against the background of a deteriorating foreign economic situation, lowering budget spending may have a stabilizing effect, but, from a growth effect point of view, it is best to initially reduce non-productive expenditures while increasing or, at least, maintaining the current level of productive expenditures," conclude the researchers. "Of course, ensuring security against internal and external threats, including through funding 'power' items, is an essential condition for the state's stable functioning and for maintaining social and economic stability. However, one should exercise prudence when determining the requisite amount of non-productive expenditures, realizing the cost to be paid by the society for this or that budget spending composition."